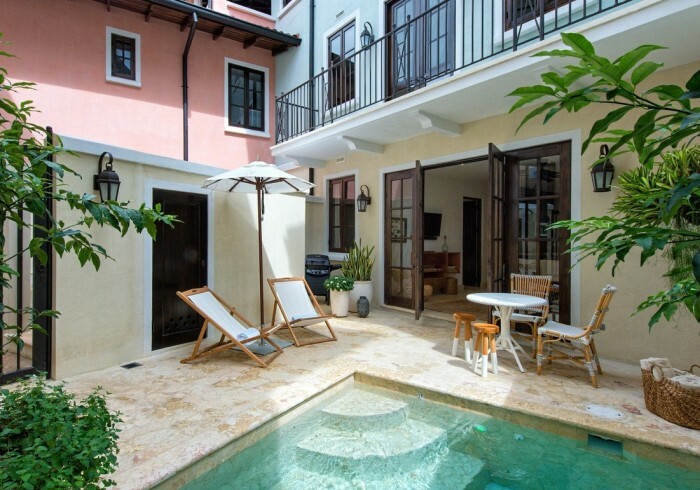 18 Avenida La Antigua is a two-bedroom, two-bathroom flat located on the flats building ground floor. With a lovely small fountain welcoming you in the main entrance, this spacious flat is the perfect combination of casual and chic. The master bedroom will wow you with its queen size bed and private bathroom, and the guest bedroom will amaze you just as much with its queen bed and private bathroom. Enjoy the company of your friends and family in the fully equipped kitchen and comfortably furnished living room, and then relax in the delightful terrace pool. All rooms and areas feature A/C, ceiling fans, TV, WiFi, and phone. Concierge service and beach club access are included. All flats feature two common areas you will not want to miss! Get your grill on in the barbeque area, or sit back and admire the sunset under the pergola on the upper deck. Each common area has its own bathroom. Additional amenities include a laundry room with washer and dryer. Make sure to ask about our additional Signature House Moms Service - 18 Avenida La Antigua is one of the few flats offering this handy service!